Walking in Singapore is best done in early morning or late evening when the temperature becomes more bearable even though humidity remains a constant 90% throughout the entire day (and night). 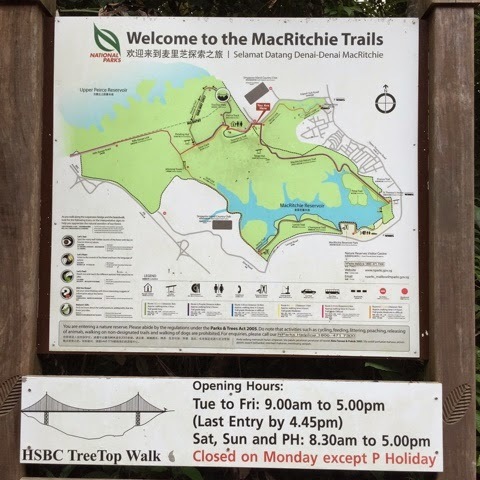 But to venture to Treetop walk at Macritchie, I had to brave the afternoon sun as the trail closes by 5pm. I chose to access the trail from Venus Drive, off Upper Thomson Road - frankly because it was a shorter trail (2.5km) vs. the other access point which is another 2km away. Walking can be therapeutic as you only need your physical body to get you ahead. For me, this is one activity that can be an enjoyable activity even if I do it alone. In this area, you almost feel like you are at one with nature with birds chirping and crickets sounds surrounding you the whole way. When I was up on the walkway, it was literally a bird's eye view as you are above the canopy of trees with a panoramic view of the nearby Upper Peirce Reservoir. There will be a one-way system on the Tree Top Walk. That is, visitors can only enter from the Bukit Peirce entrance (via Peirce Track). Walking towards Bukit Kalang, visitors will exit along the Petaling Trail. More FAQs about the Walk on the NParks website. Till the next time, into the world and beyond!